This book is aimed towards the general public with an interest in the field, historians interested in an innovative view on history, archeo-astronomers and astrologers (both novices and advanced). History at first glance may seem like a series of chaotic events, but when seen from the perspective of the astrological ages and their subperiods, history follows defined patterns that rhyme with the astrological ages. This book is certainly not the first attempt to do this, but it is the first to do so based on a revised alignment of the astrological ages with the Aquarian age arriving in 1433 AD (or up to a maximum of two years earlier). The 1433 AD arrival of the Aquarian age is not a fanciful claim – it is based solely on the evidence and logic – which is fully explored in the book. However to keep the book palatable to the interested general public, the heavy-duty astrological concepts associated with the astrological ages are relegated to the appendices, but available to the serious researcher. The reason why the Aquarian age arrived in 1433 AD (or up to two years earlier) is based on the sub-periods of the astrological ages. Certainly there is an Aquarian age lasting some 2150 years, but too few people (and researchers) realize that each astrological age has three decanates (decans) of around 717 years each. Each of these three decans in each age has identifiable historical developments associated with them. In addition, each astrological age has 12 sub-ages based on an established practice that has antecedents of over 2,000 years. Each sub-age is approximately 179 years each. These sub-ages contain 12 micro-ages each of approximately15 years each with clearly defined historical developments associated with each and every sub-age. Furthermore, each sub-age has 12 nano-ages of approximately 15 months each. It is through relating nano-ages with historical events that it is possible to rectify the Aquarian age (or any age) to within a maximum error of three years (or about two nano-ages). 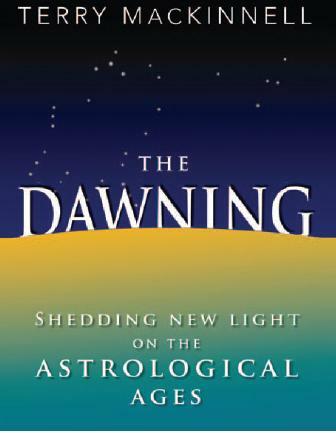 The Dawning is mainly focused upon the astrological ages of the last 12,000 years, plus the age-decans of the last 5,000 years. Only minor attention is paid to sub-ages and smaller periods in this book, and this information is principally found in the appendices. Hopefully the sub-ages and smaller periods will be fleshed out in future books on the subject. Nevertheless, the argument presented in this book should be convincing to many people. In this book, I attempt to demonstrate how historical developments, events, cultural inclinations, religions, and so on, follow distinct and readily observable patterns and that these patterns synchronize with the astrological ages and associated subperiods. Most of this book examines the past for the purpose of recognizing patterns, which can be extrapolated into the future. The intent of this book is not prediction, but it will incorporate some predictive musings. These predictions will be placed in the context of demonstrated patterns in the past and present. An open-minded reader should be able to understand both the predictive process and the source of the predictions. A proficient astrologer could apply these predictive techniques as demonstrated and make even more detailed predictions. The musical Hair proudly proclaimed in the late 1960s that “this is the dawning of the Age of Aquarius.” Since then the Age of Aquarius has become part of our cultural milieu to the extent that many Westerners have an opinion on the Age of Aquarius, including those who are antagonistic to astrology. Occasionally when I express to someone that the Age of Aquarius arrived within a few years of 1433 CE, the reaction is usually one of amazement and sometimes hostility. The most common response is along such lines as, “Isn’t the Age of Aquarius just starting around now or soon?”This is because the ages, or more specifically the Age of Aquarius, have entered into the realm of contemporary mythology. What is the Age of Aquarius and what is its meaning? What came before it? How long does it last? When exactly does the Age of Aquarius start and how long is its dawn? Is there any connection between the ages and the common astrological sunsigns? For example, will someone born with their Sun in Aquarius handle the new Aquarian age better than people without this Aquarian resonance? Despite the acceptance of the Age of Aquarius into our cultural milieu, very little is known about it by the general public. Even astrologers don’t fare much better. It is commonly expressed that the Age of Aquarius will usher in a new era of peace and harmony. This statement assumes that the previous age (which the Aquarian age replaces) was more negative or somehow lower in standard. The age before the Aquarian age is the Pisces age. Is the zodiacal sign Pisces bad and Aquarius good? Many astrologers believe it is absolutely ridiculous to claim that the Aquarian age arrived in a specific year such as 1433 CE. Because ages are so large at around 2150 years each, how can they have an exact start in an actual year? Many astrologers are far more comfortable with the concept that an age dawns over many centuries—or as one tongue-in-cheek online blogger stated—“the yawning of the Age of Aquarius.” This vague and indeterminate approach to the cusp of ages is not supported in any other branch of astrology. Furthermore, astrology, since the time of the ancient Greeks, has followed a highly exact and mathematical approach. Based on this mathematical approach to astrology, any age should have an exact starting date. So while my precision may seem untenable, once the date calibration technique is revealed it becomes obvious. However, I do agree that it is impossible to delineate the exact year of the arrival of a multi-thousand years age based solely upon examining historical correlations to the ages. Historians are good at identifying the approximate century of the start of significant historical periods. Arriving at the correct century is one thing, getting the exact year is another! However, there is absolutely no theoretical reason against doing so. The sign change of the Sun, Moon, or planet can be determined with precision so why cannot an age be determined to a specific year? Ultimately, an age should be determined to even an exact month or perhaps even an exact day and hour! My approach to understanding the astrological ages involved recognizing the input from historians—who are naturally the experts in this field. I therefore turned to historians’ views upon major historical epochs. A large number of historians agree that the fifteenth century CE marked a significant historical shift in the world—coinciding with the Age of Aquarius arriving in the fifteenth century. A whole genre of recent historical research has been focusing upon the last 500 years. Its repetitive theme points to the fact that something momentous occurred around 500 years ago (i.e., the 15th century). The opening statement by the cultural historian, Prof. Richard Tarnas, in his book Cosmos and Psyche is that the “modern self” appeared slightly more than 500 years ago. Tarnas further asserts that, when this modern self appeared, it stood out due to its astonishing impact. This is another example of an association with Aquarius—anything sudden, unexpected, and like a thunderclap is an expression of the Aquarian archetype. Tarnas claims the convulsions of the Renaissance, the Reformation, and the Scientific Revolution gave birth to the modern world and the modern mind. Tarnas also states that within a generation mankind moved from their medieval predecessors and assumed superhuman status with the likes of da Vinci, Michelangelo, Raphael, Columbus, Luther, and Copernicus. He elevates the achievement of Copernicus as representative of a “fundamental intellectual turning point”—as a highpoint of human reasoning introducing the modern age to the world. The Copernican view of the universe removed humanity from the focal point of the cosmos. These claims by Tarnas propose a highly significant major shift in the fifteenth century, appropriate at the introduction of a New Age. The eminent British historian Arnold Toynbee (1889–1975 CE) in Mankind and Mother Earth states that between c.1400–1550 CE, the traditional picture of social habitats around the world was totally transformed, as knowledge of different cultures became widely available. This is a mighty change. Toynbee states this change was sudden and brought immediate changes of fortunes to many people, some for the better and many for the worse—especially the indigenous inhabitants of the Americas and western Africa. He further states that, in the 200 years since 1563 CE, Western civilization made its greatest spiritual and mental leap forward since the fall of ancient Rome. This is the kind of change expected at the arrival of a New Age. The Collins Atlas of World History places the fifteenth century as one of those turning points in history, emphasizing that this century laid the groundwork of modern capitalism and began the first capitalist age.The Australian historian, Prof. Geoffrey Blainey states that the Middle Ages spanned the period from 500 to 1500 CE, and that the late 1400s marked the time for the mental awakening of Europe, hastened by the invention of the printing press in the mid-1400s. Blainey claims that the last part of the 1400s was the most striking convergence of key events experienced in the world to that time, with its focus upon western Europe. These influential events included printing, the Reformation, the Renaissance, heralding a new approach to painting, and sculpture and architecture. The excitement of those times was infectious and promoted intellectual adventure. Blainey states it is curious that no “all-embracing” name refers to the massive developments around 1500 CE, and that it is probably too late to assign one. The arrival of the Aquarian age fills that gap.